As the holiday season is upon us, we are once again hosting a blanket drive during the month of December. It was such a success last year and we hope to continue to build on that this year! 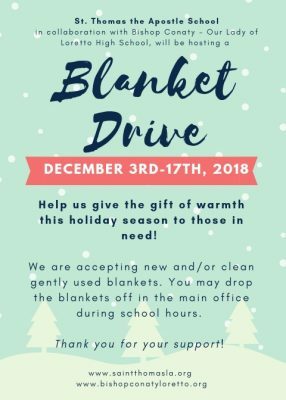 In collaboration with Bishop Conaty – Our Lady of Loretto High School, we will be collecting new and/or clean gently used blankets to giveaway to those in need. Blankets may be turned in to the main office during school hours. After our collection is over, school representatives from both schools will be dropping off donations at the Midnight Mission in Downtown LA. Thank you for helping us give the gift of warmth this holiday season! If you have any questions, please contact Ms. Rivera.